Moen Gafoor survived two close games to Michael Benjamin and Yvonne Murray to register wins by spreads of 18 and 16 respectively, eventually chalking up 6 games and a positive spread of 352 to cart off the spoils when affiliates of the Guyana Association of Scrabble Players (GASP) contested for a notch on the Earl Vigilance memorial lien trophy at the Mackenzie Sports Club, Linden, Sunday afternoon last. 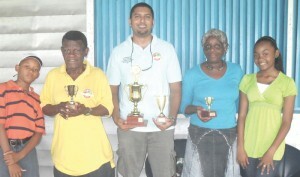 Moen Gafoor (centre) poses with Yvonne Murray (2nd right) and R O Michael (2nd left). Vigilance’s off springs Shanygne (extreme right) and Tyrese. Rudolph O Michael scored one game less than Gafoor with a positive spread of 188 to finish second while Yvonne Murray amassed 3 games with a positive spread of 129 to seal off the podium spots. Benjamin also finished on three games but a negative spread of 2. By dint of his win, Gafoor now has two notches on the trophy after winning the inaugural championships in 2008. Local national champion, Abigail McDonald is the other player with a lien on the trophy after winning last year’s tournament. She did not compete in Sunday’s championships. Gafoor dominated the morning sessions with victories over Colin Chichester (26), R O Michael (144) and Yvonne Murray (16). Murray’s pre lunch victims were Michael Benjamin (79) and Orlando Michael (49). R O Michael won a bye in the first game and lost the second to Gafoor before defeating Colin Chichester (129) to close off the morning session on 2 games and a positive spread of 223. Murray’s pre-lunch victims were Benjamin (79), and Orlando Michael (49). Activities developed into a tensely contested tournament after lunch was taken. Gafoor chalked up his fourth win on the trot against Orlando Michael (59) before facing Benjamin. The latter player tested the former to the hilt, holding on to a slim lead up to the last two plays in the game. Gafoor employed the wits of a seasoned player to eventually survive by a close spread of 18. Ten of those points were accrued by default after Benjamin went over the allotted time by one minute. Gafoor then closed off a successful day with a shut down over Ruby Cummings (89). Meanwhile, Vigilance’s two children witnessed the tournament and eventually handed out the prizes to the respective winners. They both expressed delight at the competitive nature of the tournament even as they acknowledged the efforts of GASP to honour their dad. President of GASP, Moen Gafoor also lauded the high level of competition and congratulated the participants. “The level of competition was extremely high and is reminiscent of those contested by Earl,” he said. The next tournament on GASP calendar of activities is the Caricom tournament slated for July 5 at a venue to be announced. The players convene for practice sessions at the Malteenoes Cricket Club, Thomas Lands every Thursday starting at 19:00hrs.